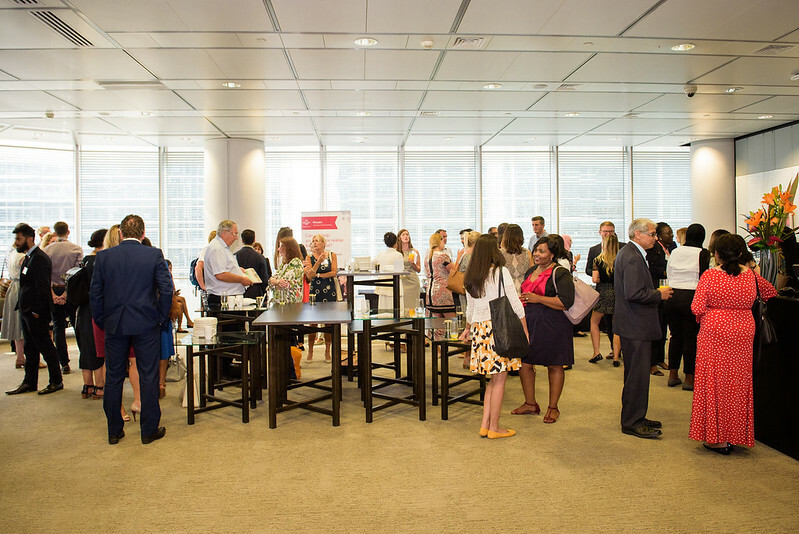 The second week of Mosaic Connect events are underway continuing this week in London for an evening generously hosted at the HSBC’s Canary Wharf office. Guests, supporters and beneficiaries came together for an evening celebration of the end of what has been a great year for the Mosaic programmes in the South, which explored the theme of ‘Relatable Role Models’. The evening featured an insightful Q&A with Uzma Hasan, Film Producer and Founder of Little House Productions by young people Briana Williams and Yaw Opoku – both members of the 2017 Mosaic Enterprise Challenge winning team, YouTe@ch. The evening also featured a special panel discussion with Selina Chilcott, a Mosaic Secondary School Programme mentor and Global Banking and Markets Problem Manager at HSBC and Dalia Abubakr, Communication and Enterprise Coordiantor at Skinners’ Academy joining Briana and Yaw in Q&A about their experiences, respective journeys with Mosaic and the idea of ‘Relatable Role Models’. These regional celebration and networking events aim at bringing together and connecting the different components that make the Mosaic Initiative and the Mosaic mentoring programmes at The Prince’s Trust such a success across our regions.